Vintage and Classic Cars, walkers and cyclists welcome. Perth 20 miles, Glamis Castle 7 miles. In the southern foothills of the Grampian mountains lies the small town of Alyth. Centred around a Market Square, a 16th century stone bridge and the clear running Alyth Burn, it is home to about 2000 inhabitants, a strong, friendly community who take a pride in their town and its history. 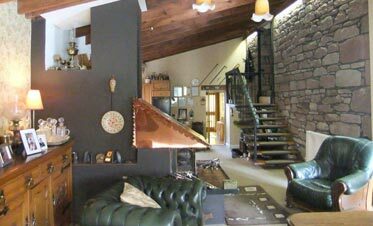 And none more so than Bill and Eileen McBain who welcome guests to stay for bed and breakfast in their home which they converted from the remains of an old stable barn in 1980. Locally there are many excellent restaurants and pubs, two very close by. There are approximately sixty golf courses within one hours drive, three of these in Alyth along with a flood-lit driving range and Golf Academy. The coast is 45 minutes. Once here you may prefer take time to walk around Alyth itself, visit the gift shops, speciality craft shop, hardward and butcher shops or walk through the valley of natural woodland, water and sandstone cliffs on the edge of the town known as the Den O' Alyth and is an SSSI (Site of Special Scientific Interest). The walk has become so popular that a video has been made of it. Eileen has written several leaflets and produced a DVD collating history and information about the locality and both she and Bill are immensely enthusiastic and knowledgeable about the area. 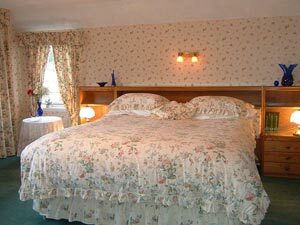 Three B&B bedrooms: Strathmore is twin bedded. Loyal has a superking bed. Ruthven with the fourposter is on the ground floor. 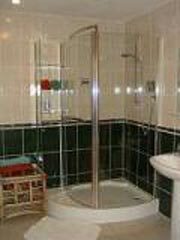 Each with bathrooms en-suite, a hairdryer, and tea/coffee making. A drying area and iron are available. Wi-Fi is available in MOST of the house. 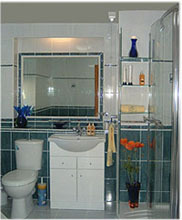 Loyal Superking room on upper floor with bathroom with shower and whirlpool en suite. 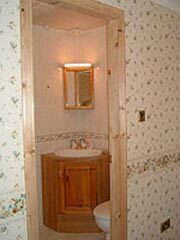 Strathmore, an upper twin or superking bedroom with en-suite shower room. 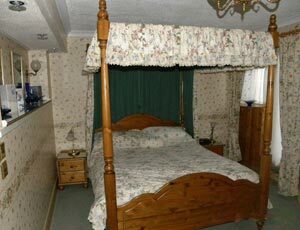 Ruthven Four Poster Room with Bathroom en suite (cubicle shower, wc, whirlpool bath). 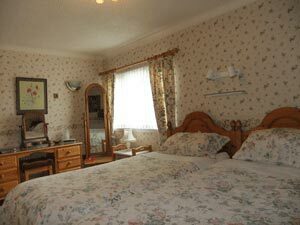 A ground floor bedroom opening to the garden with patio and seating for guests. 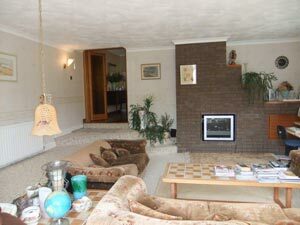 Below left; In the wood-beamed lounge is a raised woodburning fireplace with beaten copper hood. Home-baked bread, home-made jams and marmalades, freshly brewed coffee, tea, generous cooked breakfast or lighter continental breakfast. Discounts are be available for stays of 3 nights or more. 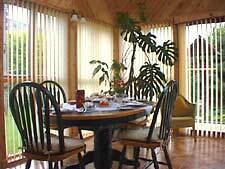 Various short breaks and offers may be available. Please arrange your arrival to be between 5 pm - 7 pm or by prior arrangement. Eileen's collection of traditional Scottish iron-ware in front of part of the original farm steading wall. Please tell Bill and Eileen you found Old Stables through About Scotland! 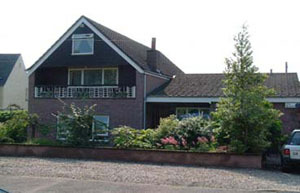 For classic car or vintage enthusiasts Old Stables B&B is the ideal B&B. Bill has several old cars in various stages of restoration along with garage facilities which has been his business for over thirty years. So bring your own Classic or Vintage Car and tour Scotland UK!